There are quite a variety of camping styles to choose. Some prefer camping out in cabins, where some enjoy pitching their own tent. However, no matter what kind of aesthetic you prefer, we can all agree that comfort comes above everything else. So, let’s talk camping chairs. Usually the flimsiest tools of comfort anyone brings on their camping excursion, I am here to tell you what to look for to get the best deal, not just with money but also with durability and comfortability. The Kijaro XXL dual lock chair is one of the best chairs you can buy for summer camping trips. With a built-in mesh back for a more breathable sitting experience, you also have dual cup holders to hold plenty of beverages. Plus, the chair also comes in a variety of different colors to choose from. The Kijaro can also withstand up to 400 pounds of weight in case you plan to load your heavy gear onto your chair. So, if you’re looking for a comfortable camping chair with plenty of features, the Kijaro is a great one to check out. 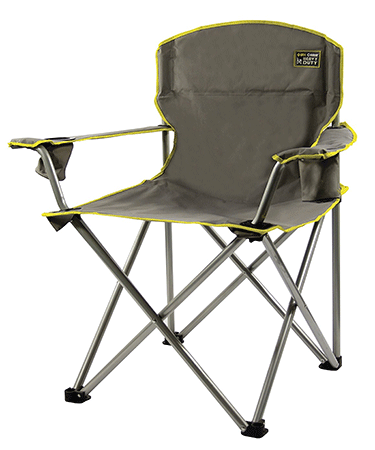 The Quik Shade MAX is a great camping chair for those camping in sunny or rainy conditions. Thanks to the waterproof canopy, you can be protected from any sun or water, preventing soaked clothes or sunburns. In addition, the chair is supported by a metal frame to prevent unnecessary wobbling and combine extra durability. This chair can also support up to 225 pounds of weight. This unique folding director’s chair is made of an all metal frame with a comfortable cloth body. It also has a durable side table with side pockets for accessories. For on the go travel, this chair is great since it can be setup in seconds. 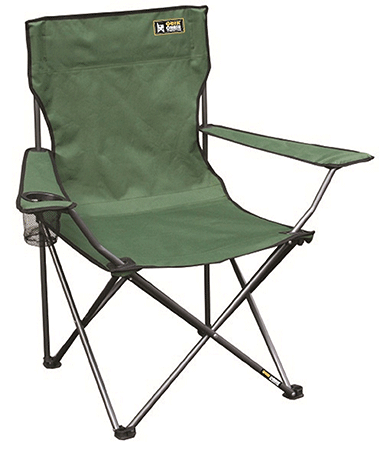 If you are looking for a basic camping chair at a great price, check out this chair by Quik Shade. 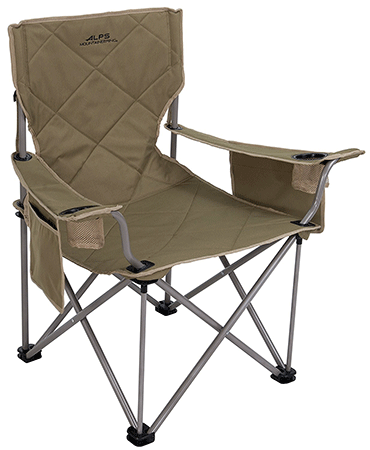 This camping chair has a durable design and can support up to 225 lbs. 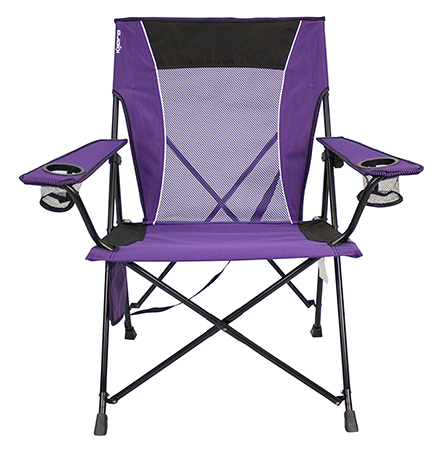 With this chair, you will get a built-in mesh cup holder and a carry bag for easy portability. If you are searching for a stylish camping chair, look no further than the Kijaro Dual Lock Folding Chair. This chair is available in every color of the rainbow, plus a few more. It also comes with two cup holders, cell phone holder, and other storage pockets. Setting up this chair is easy and secure thanks to its dual lock system. Simply push a button to lock and unlock the chair when you want to set it up, fold it, and carry it. It also comes with both a carrying strap and carry bag, making it super portable. 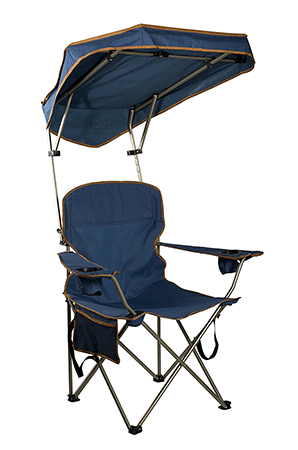 The Sport-Brella Recliner Chair is ideal for a day at the beach or tailgating in the park. 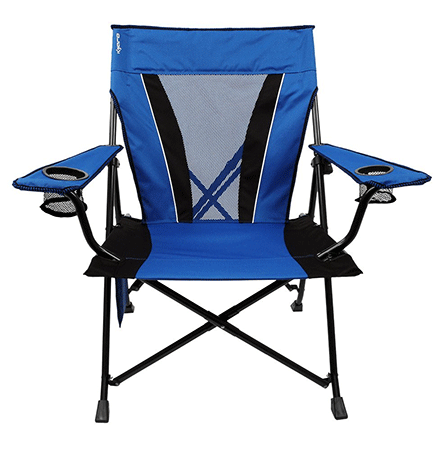 This luxury camping chair is available in two stylish colors, blue and red. The seat can be adjusted to three different settings: sitting, reclining, and lying all the way back. This chair comes with a built in cooler pouch, cup holder, storage pocket, and bottle opener. 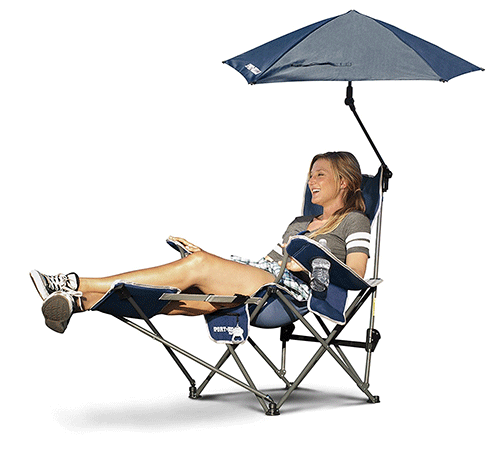 One of the best features of this camping chair is the attached umbrella canopy. This umbrella is highly adjustable, provides protection from UVA and UVB rays, and provides UPF 50+ protection. The Sport-Brella Recliner Chair also has a lightweight and strong design. 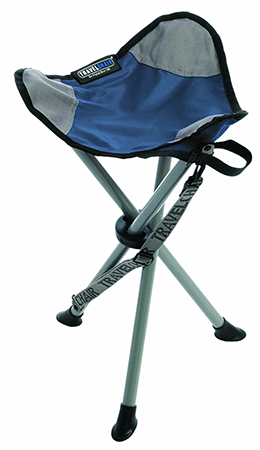 Any serious campers and backpackers will want to check out this lightweight camping stool. This tripod camp stool weighs just over two pounds and folds very compactly. This makes it especially suited for backpackers. It is built to last with its strong steel frame and durable nail head and ripstop polyester seat. The stool also features large nylon feet that will prevent the chair from sinking into the ground. For the price, you really can’t find a better camping stool. For the ultimate in space and comfort, you will want to check out this oversized camping chair. The Quik Chair boasts a durable steel frame that can support up to 500 pounds. The seat is also larger than most other camping chairs on the market. The chair has two arm rests and two built-in cup holders. The seat is made of water resistant and stain proof nylon. The camping chair is also highly portable, coming with its own carry bag and weighing only nine pounds. 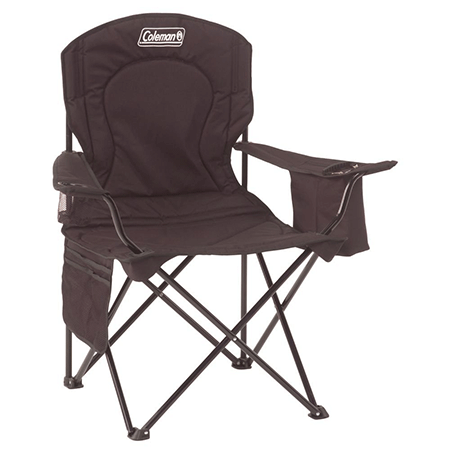 The best camping chair on the market in 2018 is the Coleman Oversized Quad Chair with Cooler. This luxury camping chair comes with all the bells and whistles. This chair has adjustable armrests, a mesh cup holder, storage pocket, and a four can cooler attached to the arm rest. This chair is also highly durable and can support up to 300 pounds. Both the seat and back are fully padded providing maximum comfort. Also, this chair comes with a carry bag for easy transportation and storage. There are a few factors you will want to keep in mind when picking out your new camping chair. Comfort: If you are going to be sitting in your camping chair for an extended period of time, comfort will definitely be a priority for you. Look for comfort features like padding, arm rests, and ventilation. Size and Weight: Camping chairs come in a variety of sizes and weights. Some are smaller and lower to the ground, whereas others a more luxurious. The size is usually a matter of personal preference. Weights, however, you will want to consider no matter what. Take into account how far you will have to carry your chair before reaching your campsite and how many other things you will need to carry. Generally, larger, luxury chairs will also weigh more. Durability: The material of the chair will play into its durability quite a bit. Common materials for camping chairs include nylon and padded foam. Nylon is light, durable, and weather resistant. Foam provides extra support and comfort. Make sure your chair is durable enough to last you more than a few camping seasons. Portability: A lot of camping chairs are foldable and come with a handy carrying bag with handle. Determine the packed size and weight of each camping chair. This will come into play when you are traveling to and from your campsite and when it is not in use and in storage. Extra Features: Some common features of camping chairs include arm rests, cup holders, built-in headrests, wheels, straps, storage pockets, and more. Determine if you want or need to have any of these features included in your camping chair.